Healthy, delicious, and always appreciated, this bountiful fruit basket overflows with the freshest fruits and most delicious gourmet goodies. Fruits may include apples, pears, oranges, and bananas with tropical indulgences such as citrus or pineapple when in season. Gourmet delicacies may include cheese, olive oil, crackers, chocolates, cookies, or tea. With such a great selection, there's more than enough for the entire family or office. To ensure the freshest, ripest fruit is delivered, pictured fruit may vary according to location and availability. if ordered by 12:00 pm EDT Saturday April 20th. 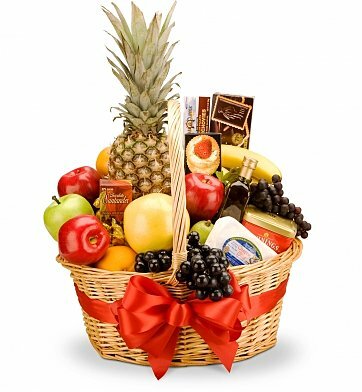 Connoisseur Fruit and Gourmet Basket is a hand delivered gift. These gifts are delivered by one of our local design centers located throughout the United States and Canada. Same day delivery is available for most gifts when ordered before the cutoff time. The cutoff time for Connoisseur Fruit and Gourmet Basket is 9 AM in the recipient's time zone. The basket I ordered was a sympathy basket for my daughter & son-in-law. Although I did not see it, I was told that it was beautiful, very fresh looking and plentiful. My daughter said all of the fruit that was in it looked wonderful & there were several choices. She was especially thrilled with the pineapple. The cheese, crackers etc. were a plus. I will be ordering all of my gift baskets from here in the future. I didn't see the basket but I have gotten a very nice phone call about how beautiful it was. The fruit was so fresh and they couldn't believe how big it was. Very, very nice basket. I will use this site again.